Over the last few years we have been writing articles on a weekly basis covering a wide-range of topics on 4WDing and Insurance. During that time we have grown our audience significantly and hence, many of you may have missed out on the topics covered in weeks and months gone by. 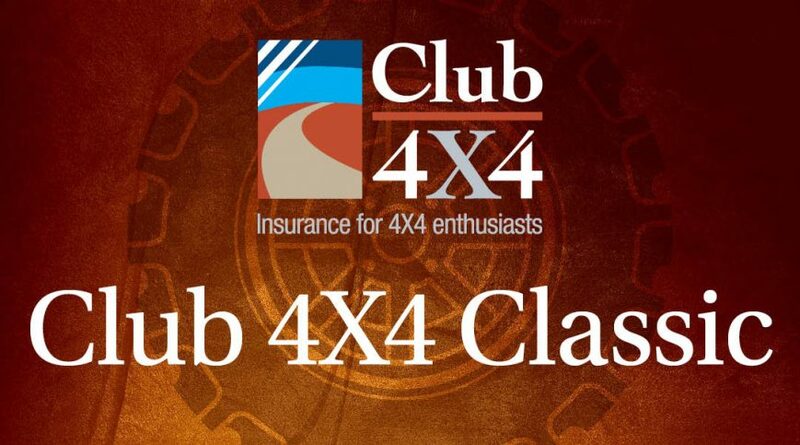 Please join us in revisiting some of our most popular and thought-provoking works – the Club 4X4 Classics. Modifying our 4X4s to improve their performance and longevity for the kind of travel we do is integral to our hobby. It’s like a camp oven damper and golden syrup – both delicious in isolation, but it’s when they come together that the real magic happens. Whether it be a suspension upgrade to allow a bit more clearance and provide a more balanced ride when towing a 24ft caravan, or the latest barwork to protect your vulnerable panels and improve approach and departure angles, the end goal is the same – we invest in our machines to make them more fit for purpose. One of the most important considerations in putting together Club 4X4’s Comprehensive 4X4 Insurance policy was ensuring we were providing a product that protects the significant investment we make in preparing our rigs. We are proud to say we now have thousands of happy customers on board, 95% of which have some form of modification or accessories added to their trucks. Often the value of these modifications and accessories exceed half of the value of the vehicle and in some lucky cases, above the value altogether. The key difference of our product is the way we value your vehicle. You can choose a market or agreed value for the truck itself, then we will ask you what your modifications and accessories are worth. Depending on the value you nominate, there may be a need to sight photos and a list of your modifications, but if that all checks out, we will add the two values together to provide you the most comprehensive total sum insured on the market. See the below for an example. Over the last few months we have had a number of questions from policyholders and potential customers around our coverage of illegal modifications and accessories. From the outset, I want to make very clear that Club 4X4 does not condone modifications of an illegal nature. Those that choose to illegally modify their trucks walk a tightrope with law enforcement and their insurance coverage, let alone the effects some modifications have on the safety of the vehicle on and off road. There are ways around this and as most will know, we all have the opportunity to engage an engineer in the process of building our trucks. As a rule, a customer who goes to the effort to get their vehicle engineered will be fully covered in the same way we would cover a vehicle that is modified within the legalities of the state they register in. Many moons ago in the planning phase of Club 4X4, the intent was to up-skill the team around the legalities of modifications, so that assessments can be made on whether a vehicle was roadworthy or not. The challenge was maintaining the currency of knowledge given the differences in legislation in each state, as such we chose not to go down that path. We chose to put the responsibility for road-worthiness on the policyholder; not dissimilar to other insurance policies on the market. As such, we are happy to cover all modifications and accessories within the process outlined earlier, with no assessment or judgement made on legalities. The key question however, is will we cover illegal modifications when it comes to claim time? The simple answer is, yes, unless it is found that any illegal modifications you’ve made to your vehicle contributed to your claim. As an example, if your vehicle rolls on or off-road, and during the process of assessment it is found that you had a suspension lift that is higher than the legal limit, we will investigate further as it’s a well known fact that a higher centre of gravity will affect a truck’s propensity to roll. If it is determined that this is the case, your claim may be refused or reduced. However, if you’re claiming for damage to a rear bumper when you hit that bollard in the car park, then the likelihood of that same lift being contributory to the claim is removed. 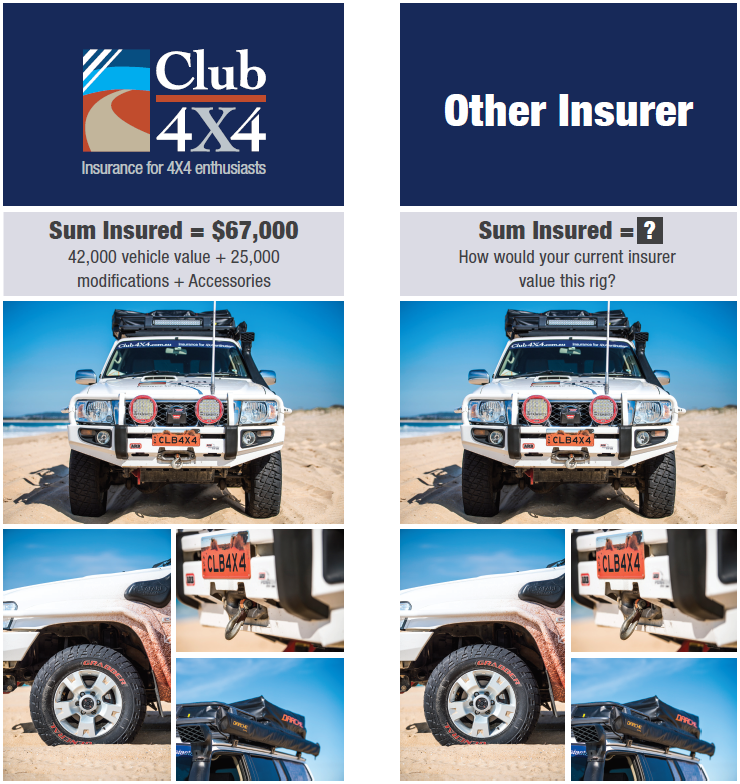 Each case will be slightly different and as stated before, we don’t condone illegal modifications, but the above examples will give you a guide to how we want to manage claims at Club 4X4 – with a reasonableness test. Regardless of who you decide to insure with, the safest option for everyone is to stick to modifications that are legal. But if you choose to insure with Club 4X4, you should have some comfort that we understand what you need and will always apply sensibility into our processes. After all, we are the insurer for 4X4 Enthusiasts. Yes we will, please give us a call on 1800 CLUB 4X4 (258 249) and we will sort it all out for you. I disclosed on my application for insurance I had heavy duty ARB suspension and slightly higher profile tyres than stock. My vehicle is still within 50mm of stock height and therefore legal. How do ai find out if these modifications are listed on my policy so there is are no issues should I ever have to claim? I’ve been trying to find an engineer that will ok my several mods that put me in the illegal basket. My vehicle handles better since the mods have been implemented but the engineers in NSW are so scared of the implications they won’t sign off. Does anyone know of an engineer that is sympathetic to older 4wdrive owners that could help me?